After three different review sessions today I needed a break...so I tried a block that I'll be making soon in Krystal's fabric of choice. It's from Block Party--The Modern Quilting Bee. I wanted to try an overall pattern on the large triangle (and I love it...especially that it looks better messy). Still not sure about the stripes...stitch in the ditch may be my favorite so far. 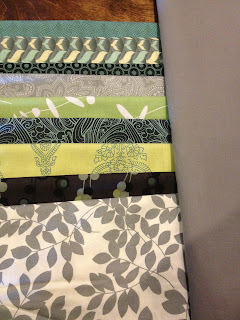 I love, love, love your quilting! Thank you so much for linking up! Very pretty. Love your quilting, very original.